Ideal Rome flat and house, for enjoying a splendid Italy vacation. You can choose as your Rome house a nice, elegant but inexpensive apartment in downtown Rome. Or you can stay in a five bedrooms villa with private garden at almost budget prices. Panoramic attic penthouse near Spanish Steps with astonishing view on the ancient Roman roofs. An intelligent alternative to the hotel room. An opportunity to save money while dwelling in an incomparable location. You will stay between famous shops and delightful artistic beauties. 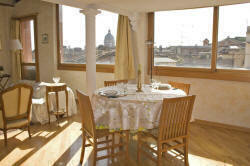 The panoramic penthouse is located in the very historic center of Rome, near Spanish Steps (Piazza di Spagna). From this core location you can reach by walk in minutes all the main Roman attractions and tourist sites. Piazza del Popolo, Fontana di Trevi, Piazza Navona and the Pantheon may be reached walking by via del Corso. You can then get to Campo de' Fiori, Piazza Venezia, Piazza Farnese, and the Colosseum (Colosseo). From Corso Vittorio you can go to St. Peter (San Pietro) and the Vatican Museums (Musei Vaticani). This central Rome flat is also very close to subway. Thanks to the two metro stops at less than 5 minutes from the lodging, it is well connected with Termini station. You can also easily reach by metro the less central attractions. Subway is also useful to quickly get to the accommodation during the day. And if you like to walk pleasantly by the nice Roman streets without minding about distances, you can reach the flat in minutes. This luxury loft to let is also close to the main tours and public bus stops. An apartment for rent in Rome Italy adds charm to your vacation. You stay in an antique historical home provided with every modern comfort. But at much less the price of a standard hotel or even a bed and breakfast. Instead of a single hotel room, you can enjoy a fully furnished double level private home. It can accommodate from 1 or 2 to 5 persons. Not just a little studio, but a 754 sq. ft. holiday apartment. In the spacious living room you can relish your lunch or candlelight dinner admiring the city. An ample sleeping area for two on the 2nd floor make you stay comfortable. There is also a large double bed and a single bed. An independent kitchen and a private bathroom give you the freedom you need. Furthermore, this short term apartment is proposed at very reasonable, all inclusive prices. It is quite cheaper than other comparable Rome apartments rented by rental agencies. And it is also less expensive than many vacation rentals by owner. An ideal stay in a city view penthouse near Spanish Steps... at the price of a budget Rome apartment. With this inexpensive Rome Italy apartment you save even more during high season periods. Rates are inexpensive even on Christmas, New Years’ Eve and Easter. A short stay vacation apartment in Rome (aparthotel) allows you to stay in an authentic Italian home. And this self catering apartment lets you to enjoy your vacation with all the comforts of your own home. This Rome private apartment is available for rent for short periods. Weekly lettings possible. Last minute reservations welcome. The flat is also listed as a classified on many short lets, travelers’ and travel related websites. Booking is very quick and simple. You just have to send an inquiry from the website reservation page. Nearby amenities: parking. Metro. Bus. Taxis. Supermarkets. ATMs. Banks. Museums. Art galleries. English cinemas. Park. Boat rental. Exercise facility. Swimming pool. Spa. Tennis. Riding stables. Restaurants. Pizzerias. Bars. Wine shops. Telephone shops. If you are looking for voip singapore then read the info . It is so pleasant to work with experts. Read more to find out more regarding agen bola terbaik. If you are not interested in trouver mon hotel , then you have already missed a lot. Stylish hotel shakespeare boutique in old town of Vilnius, Lithuania. A dependable fly fishing in belize dealer can get you what you want. The number of people who get interested in the farmhouse increases every day. Una selezione di case vacanza e bed and breakfast a Roma. Visualizza la disponibilità e prenota online alla migliore tariffa garantita Rentals Vacation Rome il modo più semplice per dormire a Roma. It is so pleasant to work with experts. Learn more to find out more regarding cheap bridesmaid dresses. For additional local musik visit musik-all. Are you looking for "best music"? Check out music4a The passionate experts in this field are ready to answer all of your requests. The professional company nevsehiryolyardim provides all the information on nevşehir mobil vinç. onlinekeystore made a real revolution in the industry. The professional company careermarshal provides all the information on hr. consultant. The professional company bookayouthworkshop provides all the information on Secondary school workshops. click here for a dependable seller that will give you the OC Services you're looking for quickly and easily. satsangaonline made a real revolution in the industry.